From 11 – 20 November, Latvian Radio Choir and its artistic director and lead conductor Sigvards Kļava will go on a concert tour around the USA and Canada. In their concerts, the choir will introduce the audience to outstanding examples of the European choir music, focusing in particular on masterpieces created by contemporary Latvian composers. The tour will consist of four concerts. 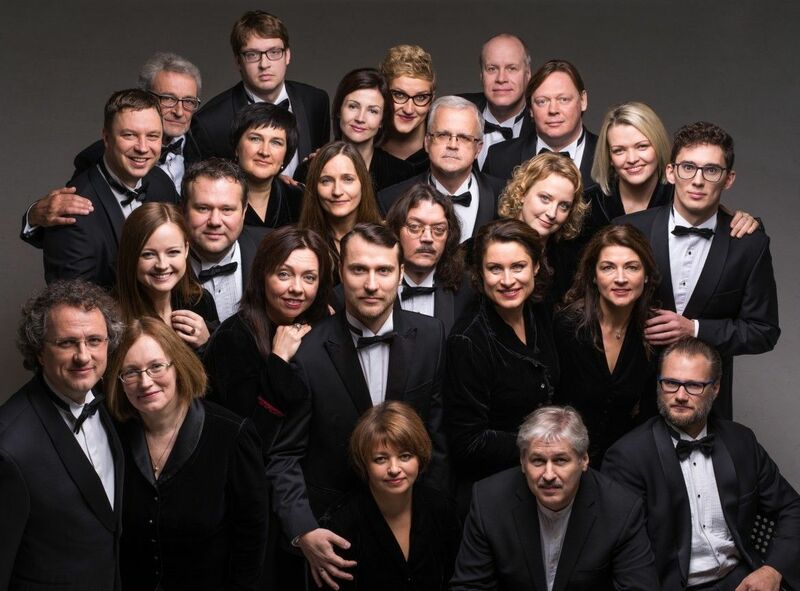 Audience at the New York concert organised by the Lincoln centre, will experience the world premiere of opus Oremus, composed by Juris Karlsons especially for the Latvian Radio Choir. This concert tour is part of the international programme of Latvia’s Centenary. Latvian Radio Choir tour programmes are always well thought through and carefully crafted musical messages, and this tour is no exception. In its concert programme, the old merges with the contemporary, international music flows together with Latvian compositions. Vocal polyphony masterpieces created by Italian Renaissance masters Giovanni Gabrieli and Carlo Gesualdo will accompany true diamonds of the choir music created by the English music trailblazer Henry Purcell, as well as the deeply touching compositions of Gustav Mahler, representative of the late Romanticism, with lyrics by German poet Friedrich Rückert. The timeless art of sound created by French mystic and professional connoisseur of bird songs Olivier Messiaen, and religious opuses by the revolutionary Russian composer Igor Stravinsky will in turn represent the 20th century. Another accent of the programme is music that can stop time and create a seemingly lasting feeling of peace. In this regard, the world-renowned Estonian composer Arvo Pärt and Ukranian Valentin Silverstrov, who are connected with the Latvian Radio Choir through decades of fruitful, creative cooperation, are true masters. Strong and special ties also link the choir together with Latvian composers, from whom it regularly orders new compositions. An example of this cooperation is Oremus by Juris Karlsons, which will see its world premiere at the concert tour’s opening in New York. J. Karlsons created this piece after having studied the Holy Scriptures and in reference to the Dogmatic Constitution of the Second Vatican Council Dei Verbum. “I feel that its author is currently undergoing a significant stage in his creative life. I can feel that, composing this piece, the author has thought of the Latvian Radio Choir as his friend in creative expression, complementing the piece with colours and options specifically created for this choir,” reveals conductor Sigvards Kļava. Composition Chu Dal by Santa Ratniece - a magical musical painting of silent waters – was created, following a proposal by Sigvards Kļava ten years ago. It confirms once again the timbral magnificence, the innovative and powerfully appealing language of sound of this composer, who has created a whole new era and style in the Latvian choir music. Choir music plays a significant role in the creative work of her peer Ēriks Ešenvalds, as well. His heartfelt and emotional opus A Drop in the Ocean combines prayers of Mother Theresa and St. Francis of Assisi. In 2018, Latvia celebrates its Centenary with events representing its culture, lifestyle and innovations in Latvia and abroad. Latvian Radio Choir concert tour is supported by the Ministry of Culture of the Republic of Latvia. In honour of Latvia’s Centenary, the Latvian Embassy to the USA will organise a reception at the Library of Congress in Washington, on 16 November, to which it has invited US officials, partners and friends of Latvia. Guests will also be invited to the Latvian Radio Choir’s concert, which will take place directly after the reception. At the opening of the reception, Latvian Radio Choir will perform the national anthems of Latvia and the USA. This reception is part of the Latvia’s Centenary public diplomacy programme, organised by the Ministry of Foreign Affairs of the Republic of Latvia. Furthermore, following an initiative by the Latvian Ambassador to Canada, Kārlis Eihenbaums, and in cooperation with the Latvian National Federation of Canada, the Latvian Radio Choir will participate as a special guest at the Latvia’s Centenary celebration at the Latvian Canadian Centre (4 Credit Union Drive) on 18 November. In addition, the choir will also participate at a special sermon at the St. John’s Church (200 Balmoral Avenue, Toronto), and a unique event initiated by the Latvian Embassy and organised by the Latvian National Federation of Canada - the raising of the Latvian flag and gathering at the Toronto City Council on Nathan Phillips Square at 9.30 a.m., where both the national anthem of Latvia and Canada will be performed.